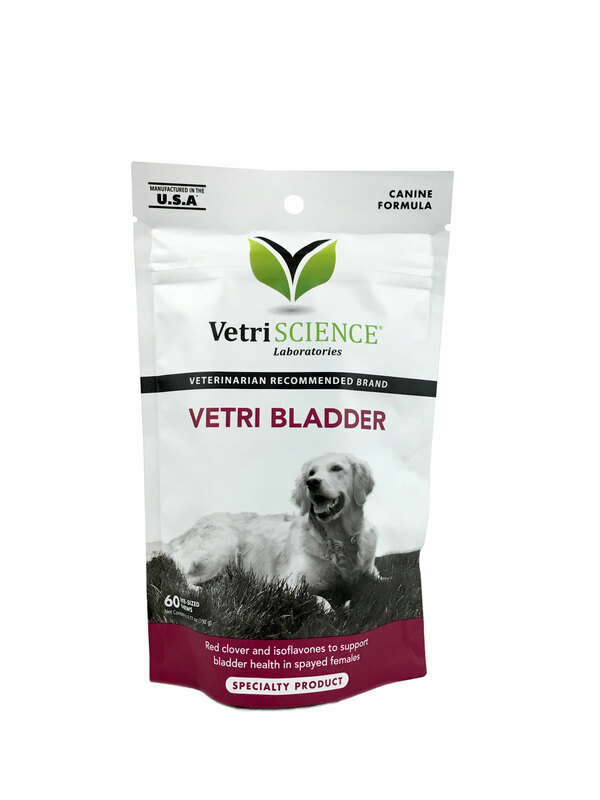 Vetri Bladder Canine is a combination of phytoestrogens that support bladder function. Vetri Bladder Canine is recommended for spayed females and senior pets to help maintain bladder control. This product contains soy protein extract, which is a source of isoflavones. Isoflavones are phytoestrogens (plant based hormones) that help maintain normal bladder muscle tone lost after spaying or during the aging process. Red Clover Flower Powder is considered to be one of the richest sources of isoflavones available. The estrogen-like effect of red clover isoflavones may attach to estrogen receptors throughout the body. Specifically, they may attach to those receptors in the bladder that will support normal urinary control. Give 1 chew per 30 lbs of body weight daily. Inactive Ingredients: apple pectin, arabic gum, brewers yeast, calcium sulfate, canola oil, chicken liver flavor, citric acid, glycerin, maltodextrin, mixed tocopherol blend, propionic acid, rosemary extract, silicon dioxide, sodium alginate, sorbic acid, soy lecithin, vegetable oil, water.